I’ve even had my own ghostly experience in the house, which was the inspiration for said script. Recently, the owners obtained a special use permit for overnight stays. This means that guests might soon be able to have sleepovers in the “bizarre yet beautiful” mansion. When I heard this, I died a little. You see, to me, this means they want to commercialize the property and make more money either because they want to (bad) or because they need to (worse). Wear and tear is just the beginning. A careless cigarette or someone conducting a “seance” with lit candles in a room could cause major damage. Normal structures can be repaired. The Winchester House is irreplaceable. Giving people a private place to get into trouble in this priceless historical monument seems incredibly risky. I’ve also fretted about Hammer making a movie inside the house. I wrote my script so that this wouldn’t be necessary. Seriously. IT’S NOT NECESSARY. You build out a few iconic rooms and some hallways on a sound stage because the house CHANGED CONSTANTLY. The house you see today is the version it was in 1922. It was totally different in 1890. And certainly still in 1901. (Outside? CGI is the only way to show passage of time as floors and windows are added.) With so many changes, who’s to say what went where? Friends of mine who engage in live-action roleplaying games are excited at the prospect of getting to do some theatrical LARPing in the house. I can understand why. The spooky Victorian interiors evoke an incredible atmosphere. My LARP friends are cautious, and they’d take good care of the space. I’m sure many people would — although the path to hell, as they say, is paved with good intentions. A lot of people see this as a good thing, and they’re very excited about it. I totally understand. Whether it’s due to the effects of time or the fault of a single, devastating incident, damage is inevitable, I suppose. I just wish that the house’s exposure to humanity could remain limited. The dead would be kinder to the house than the living. If only they had more cash. I’ll be at the film festival this weekend enjoying tons of dark features and short films. 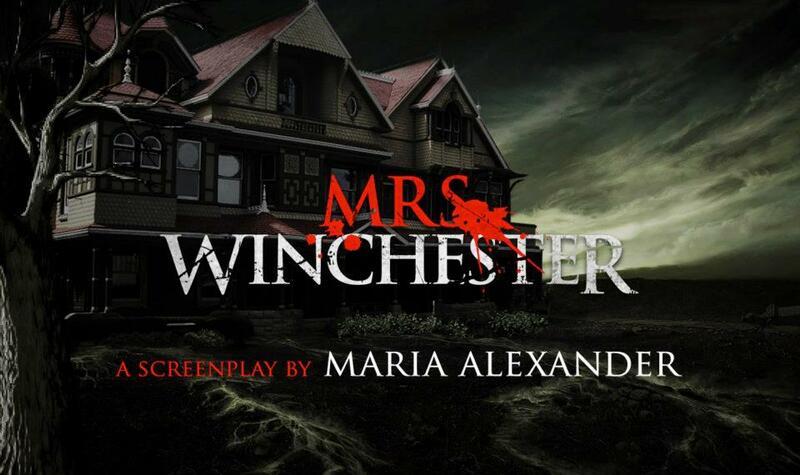 I’ll also be biting my nails, since MRS. WINCHESTER is a Finalist in the Feature Screenplay competition. Winners will be announced at the awards show Sunday night. If you see me and Trog, say hi, whydoncha! Meanwhile, my potentially incendiary topic for the WyrdCon Companion Book — Eulogies During an Accouchement: Transition, evolution and growth in LARP — has been accepted for the non-academic portion and I’m madly writing the paper. Fortunately, the book’s topic extends to interactive storytelling and transmedia, which is where my topic lives. As I’ve been writing, the subject feels like a TEDTalk, which is a good thing, I think. The paper is due November 30th. I’ll post the title and abstract as soon as I’m able. I signed the lease today for a house. The Frenchman and I shall be nesting there shortly. Me first, then him when he returns in August. It’s rather pretty inside, although not much to see from the outside. Our neighbor on one side writes for Adult Swim and the neighbors on the other side work for the FBI. A lovey-dovey pair of perverts just makes that row complete, don’t you think? Now if only Uncle Walt would get on the stick and foist upon me all this darned work they said they were about to foist upon me. Dammit. I’m going to need this new place to recuperate. Everyone’s been asking about my transition. So far, it’s a mixed bag. Where I am staying now with E/T helps, but I need a more comfortable place to write. That, I think, will make all the difference in the world. Little things are hitting me, like realizing I won’t see The Frenchman’s family for a while, nor the friends I made there. That chokes me up at unexpected moments. Things like food and climate are definitely impacting me, not to mention scenery. I badly miss seeing vineyards from the freeway. But food definitely has my system upside down at the moment. I’m walking every day and lifting free weights to combat stress. My vocabulary is weird. I’ve got French words stuck where English words should be, but thankfully not too many. My brain is still not functioning properly. Certain words in English lag behind by about a minute. Like the word “driveway” or even “boilerplate.” Why? I have no idea. I don’t even know the word in French for either. Mostly, I just feel soggy between the ears and given to moments of intense longing. The Frenchman being away doesn’t help. Yesterday morning I covered a lot of details for my return regarding my car and credit cards. I also went to Monoprix with a measuring tape. Tomorrow we’ll go to Carrefour, where The Frenchman says there are cheaper suitcases. I’ve decided the answer to my problems is to simply get as big of a handbag as allowable and put The Fabulous Coat, the laptop and Trog inside. Heck, maybe even a book or two! Woo! More strategizing today. Tonight, dinner with The Fabulous B. I might go back to L’Elfike tomorrow evening while The Frenchman watches soccer, but I might just write, too.